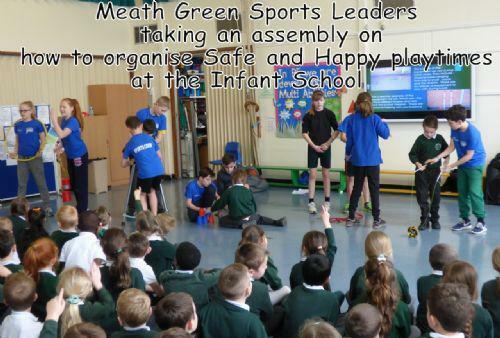 Our school was asked by the Infant School to take some of our Primary Sports Leaders to them and talk about how to create happy, safe playtimes. They took an assembly where they talked about what makes a good playground buddy and after, took the children outside to demonstrate this. This was very successful as you can see from the pictures. Our Sports Leaders will be returning to the Infant School soon to observe playtimes and assist further.